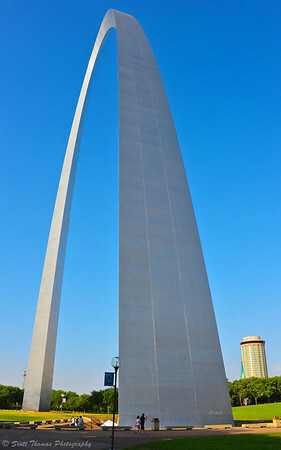 Eero Saarinen, the architect of the Gateway Arch, wanted a simple design for a memorial to the westward expansion created by the Louisiana Purchase negotiated by President Thomas Jefferson. After studying other iconic memorials, Eero decided none really fit and came up with an arch which later he described as a gateway to the West. The Gateway Arch at the Jefferson National Expansion Memorial in St. Louis, Missouri. Nikon D700/28-300VR, 1/320, f/8, ISO 200, EV +0.3, 28mm focal length. The Jefferson National Expansion Memorial in St. Louis, Missouri is where the Gateway Arch was built along the shore of the Mississippi River. It dominates the St. Louis skyline and is a very popular tourist destination year around. You enter the Gateway Arch from either the north or south entrances which take you underneath the Arch where you buy your tickets to go up to the top of the Arch in a Tram. Trams are pods which can accommodate up to five people. They are small and one better not be claustrophobic for the ride up. The pods keep you upright as they adjust every few feet up the leg. The trip is well worth it for the view. 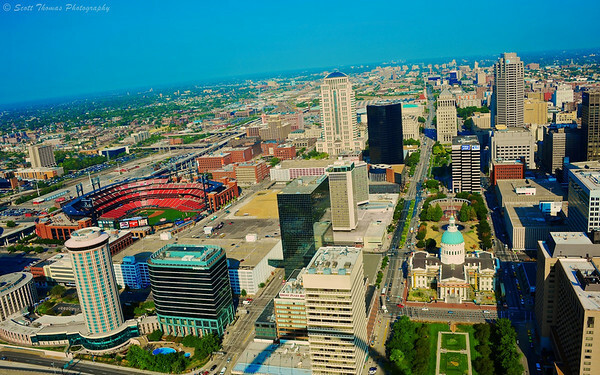 The view of St. Louis from the top of the 630 foot (192m) Gateway Arch. Nikon D700/28-300VR, 1/100s, f/16, ISO 200, EV +0.3, 28mm focal length. The view from the top of the 630 foot (192m) Gateway Arch of the city of St. Louis. To the left is Busch Stadium, home to the World Champion St. Louis Cardinals Baseball team. To the right is the Old Courthouse which is also part of the memorial. The windows at the top are small and you have to lean up against them to get a clean view with your camera. 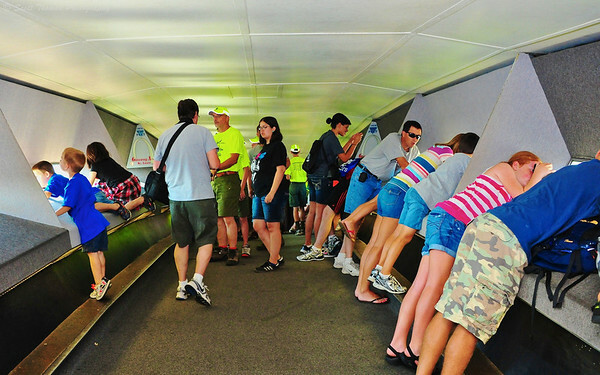 Tourists leaning close to the small windows at the top of the Gateway Arch in St. Louis, Missouri. Nikon D700/28-300VR, 1/125s, f/8, ISO 3200, EV -0.3, 28mm focal length. As you can see there is not a lot of room at the top of the Gateway Arch. If you plan to visit during the busy summer season, plan on going early. I was there at 8:30am and it was not crowded. By the time we left the Gateway Arch two hours later, there were long lines to get into the Gateway Arch and very long lines to use the Trams to the top. You can pre-pay and reserve a time on the Trams from the National Park Service website which will save you time and money as a reservation includes parking in the memorial’s garage. A grizzly bear welcomes you to the Museum of Westward Expansion below the Gateway Arch in the Jefferson National Expansion Memorial in St. Louis, Missouri. Nikon D700/Tokina 11-16mm, 1/60s, f/4, ISO 2500, EV -0.3, 16mm focal length. 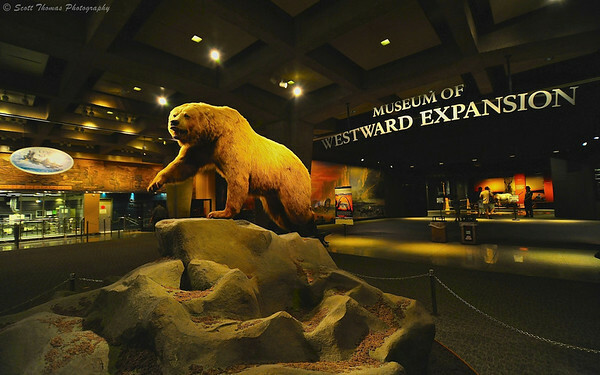 After taking my trip up to and down from the top of the Gateway Arch, I explored the Museum of Westward Expansion which tells the story of the Lewis and Clark Expedition and movement of Americans into the Western North America. There are also two movie theaters. I watched a documentary on the building of the Gateway Arch. The people who did that were very brave or very crazy. Their finished monument sheathed in stainless steel a tribute to them and the designers. This entry was posted in Travel, Weekly View and tagged 28-300mm, gateway arch, grizzly bear, jefferson national expansion memorial, missouri, museum, national park service, nikon D700, nps, st. louis, tokina 11-16mm, vr, westward expansion. Bookmark the permalink. Nice post, Scott! It took me back more than a decade when I went to Missouri to visit a friend. He took me to the Arch and I was surprised at just how SMALL those little pods are that take you up the top. They are certainly COZY—we were knees to knees to a couple of strangers and it was awkward for a few minutes, but well worth it—what a view from the top! Thanks for sharing—you should be a travel writer! Thanks, Cindy! Yeah, there were four of us and it was very cozy. We knew each other which made it easier to take. I am glad it is fully enclosed as I do not think I would have enjoyed it much if I could have seen how high were were going. Glad I could take you down memory lane, too! Gateway Arch – an impressive construction! It must have been a great experience – hope I will be able to see it once ……..